KT Engineering specializes in the planning and execution of unique tests designed to validate the design and operational performance of aerospace propulsion, pressurization, and structural/mechanical components and subsystems. KT Engineering has special test equipment, instrumentation, data acquisition, controls, software, and procedures to safely test a wide variety of high performance systems. A few specific examples are presented below. KT Engineering uses portable test rigs to perform high pressure, hot fire testing of rocket engine components. 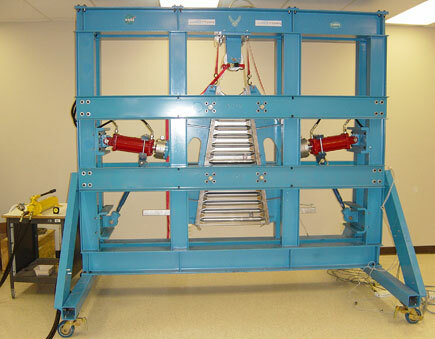 Our low-flow test rig has been used to successfully test small combustors including our family of catalytic igniters and attitude control thrusters using oxygen with hydrogen, methane, or propane fuels. This rig provides a precisely regulated supply of room temperature, gaseous propellants and inert purges. Liquid nitrogen heat exchangers are available to chill incoming propellants to cryogenic liquid or gaseous conditions. Data acquisition and control is accomplished using a Programmable Automation Controller integrated with the rig electronics. The test conductor performs each test through a custom graphical user interface (GUI) created using LabView software. 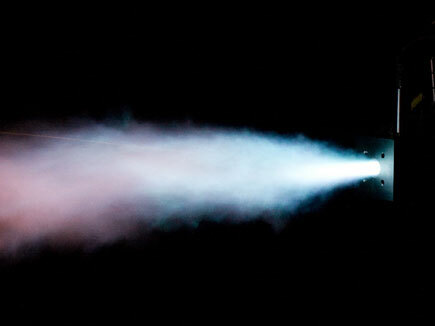 Testing of a methane combustor under an SBIR program is illustrated in the photo. KT Engineering performed a complete structural test program on a launch vehicle, flight-weight structural bulkhead under an Air Force sponsored SBIR program. KT Engineering performed custom fixture design, test planning, definition and installation of instrumentation, testing, data collection, data reduction, and reporting. KT Engineering also developed finite element models to support pretest predictions and post test comparisons. Instrumentation included strain gauges, load cells, and linear variable differential transformers (LVDT). All tests were run using a National Instruments NI SCXI-1001 data acquisition system. A custom GUI was developed using LabView. The GUI provided critical, real time measurements of stains and deflections.